Impressive. 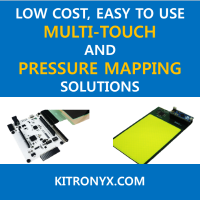 They developed a multi-touch screen with Analog Device AD7142 14 channel touch sensing IC and Altera MAX IIZ CPLD. They should promote the result through the Internet. Why is this so impressive? There are a number of touch screen controller chips out there. There are few multi-touch touch screen controller, actually. Few? Let me see, Synaptics, Elan, Cypress, Atmel, Broadcom, etc... Not to mention upcoming taiwanese chip outfits. Seems like alot to me? Yes, you are right. Many companies offer multi-touch controllers. If you work with a big company, it may be easy to get such ICs. But if you are a DIY enginner, it's hard to buy them. Let me modifiy my previous comment as follows: There are few easily available multi-touch touch screen controllers for DIY engineers.